Make a Swedish mustard, honey and dill sauce, quick-pickle some cucumbers, and hard-boil some eggs. 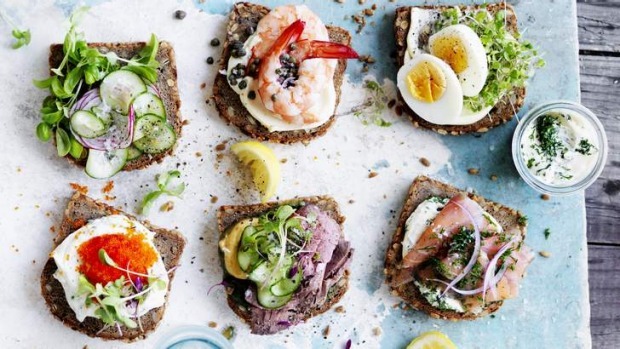 Build the picnic around one great hero – rare roast beef, cured salmon gravlax or smoked salmon – then add any extras you love such as smoked eel, canned sardines, dill pickles, salmon caviar, blue cheese, prawns, capers, jarlsberg cheese, watercress – and let your guests assemble their own open sandwiches. 1. Whisk the ingredients together for the horseradish cream. Whisk the ingredients together for the mustard, honey and dill sauce. For the quick-pickled cucumbers, toss the cucumber in the rice vinegar, sugar and sea salt and refrigerate for 30 minutes, then drain. 2. To serve, set out the sliced meats and fish, breads, spreads and toppings, and go for it.